Best practice guidelines for optimum recovery: after endurance exercise are for 0.8 to 1.2 g of carbohydrate per kg body mass and 0.2 to 0.4 g of protein per kg body mass taken immediately afterwards. RecoverAce® Endurance is the quintessential recovery product to use after endurance exercise as it addresses these guidelines directly. This advanced formulation contains a proprietary blend of both fast- and slow-release carbohydrates in the form of Vitargo® and Palatinose®, and a high whey protein source. In addition, RecoverAce® Endurance includes premium ingredients including L-glutamine, and the potent antioxidants ALCAR and alpha-lipoic acid to further enhance the recovery process. A low glycemic index (GI) CHO: is also included in appropriate amounts in the form of Palatinose® for a sustained supply of energy. This low GI CHO helps to minimise adverse fluctuations in blood sugar and sustain energy levels. 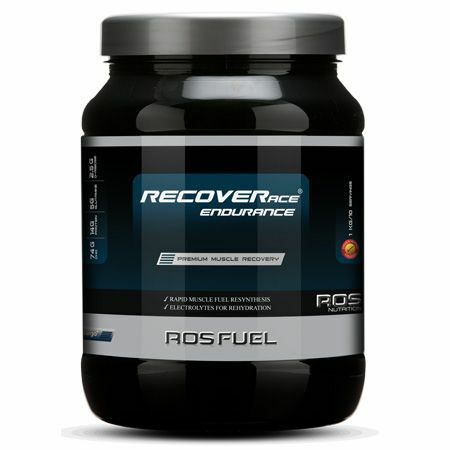 RecoverAce® Endurance is a registered trademark of ROS Nutrition Group Limited. Fruit Punch Flavour: Citric acid (acidity regulator), fruit punch flavour, beet root (colour), sucralose (sweetener). Lemon n Lime Flavour: Citric acid (acidity regulator), lemon and lime flavour, sucralose (sweetener). Orange Flavour: Citric acid (acidity regulator), orange flavour, beta carotene (colour), sucralose (sweetener). Howarth KR, Moreau NA, Phillips SM and Gibala MJ. Coingestion of protein with carbohydrate during recovery from endurance exercise stimulates skeletal muscle protein synthesis in humans. J Appl Physiol 106: 1394-1402, 2009. Jentjens R and Jeukendrup A. Determinants of post-exercise glycogen synthesis during short-term recovery. Sports Med 33: 117-144, 2003. Coyle EF, Jeukendrup AE, Wagenmakers AJ and Saris WH. Fatty acid oxidation is directly regulated by carbohydrate metabolism during exercise. Am J Physiol 273: E268-E275, 1997. Fallowfield JL, Williams C and Singh R. The influence of ingesting a carbohydrate-electrolyte beverage during 4 hours of recovery on subsequent endurance capacity. Int J Sport Nutr 5: 285-299, 1995. Bergstrom J, Hermansen L, Hultman E and Saltin B. Diet, muscle glycogen and physical performance. Acta Physiol Scand 71: 140-150, 1967. Stephens FB, Roig M, Armstrong G and Greenhaff PL. Post-exercise ingestion of a unique, high molecular weight glucose polymer solution improves performance during a subsequent bout of cycling exercise. J Sports Sci 26: 149-154, 2008. Leiper JB, Aulin KP and Soderlund K. Improved gastric emptying rate in humans of a unique glucose polymer with gel-forming properties. Scand J Gastroenterol 35: 1143-1149, 2000.
van Loon LJ, Saris WH, Kruijshoop M and Wagenmakers AJ. Maximizing postexercise muscle glycogen synthesis: carbohydrate supplementation and the application of amino acid or protein hydrolysate mixtures. Am J Clin Nutr 72: 106-111, 2000. Zawadzki KM, Yaspelkis BB, III and Ivy JL. Carbohydrate-protein complex increases the rate of muscle glycogen storage after exercise. J Appl Physiol 72: 1854-1859, 1992. Nuttall FQ, Mooradian AD, Gannon MC, Billington C and Krezowski P. Effect of protein ingestion on the glucose and insulin response to a standardized oral glucose load. Diabetes Care 7: 465-470, 1984. For best mixing results, the water should be poured into the shaker before adding the powder serving.